MINNEAPOLIS—Super Bowl 52 was a historic night for the city of Philadelphia as the underdog Eagles flew over the New England Patriots 41-33 Sunday and brought home the Vince Lombardi trophy for the first time in franchise history. In a shootout against NFL MVP Tom Brady, who fell victim to two Super Bowl Curses—no NFL MVP and quarterback leading the league in passing yards has won a championship in nearly two decades—it was backup quarterback Nick Foles throwing for 373 yards, three touchdown passes, and going as far as catching a touchdown pass, who triumphed over the designated champions. Ah…but wait! As exciting and unpredictable as the game was, it was not the reason I traveled 12 hours to the Twin Cities. While all eyes, ears, and wallets were focused on the extravagance that was Super Bowl weekend in Minneapolis, the real MVPs were found out in the streets, marching in freezing temperatures, chanting, fighting corporate greed, and taking a knee against injustice. You probably didn’t see them on television, though. They were blacked out by major media outlets, on purpose, in order to maintain the illusion of perfection during Super Bowl weekend, according to an unnamed source from the Minnesota Star-Tribune newspaper. As the Super Bowl host committee began final preparations at the downtown Hilton hotel for the 2018 Super Bowl breakfast that would recognize Benjamin Watson, winner of the Baltimore Ravens 2018 Bart Starr Award, around a hundred low-wage workers and allies converged outside the main entrance to call out corporations who spent millions to become the NFL championship host city, while paying thousands of workers poverty wages. “I’m out here in the freezing cold today because they [NFL corporate sponsors] have enough money to put this event on, pay for extra security, free hotel rooms, personal drivers, and shuttles, but still refuse to pay us workers a living wage and provide us with actual benefits,” said Alexis Collins, a Taco Bell employee and leader with $15 Now Minnesota, the local Fight for $15 campaign. In the NFL’s Super Bowl wish list to Minneapolis the phrase “at no cost to the NFL” showed up nearly 200 times. It means the host city had to provide the NFL with 35,000 free parking spaces, thousands of free hotel rooms, hundreds of free buses and limousines, free billboards, free security, free food, and an exemption on paying all sales taxes, among hundreds of other specifications. Many of those costs would be covered by the $53 million raised by the local host committee’s private fundraising campaign—many of those wealthy donors sat inside the Hilton, claiming they can’t pay workers a living wage. 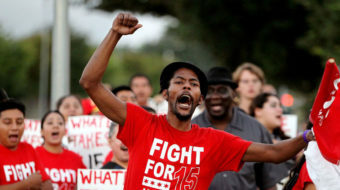 As snow began to fall, workers could be heard chanting: “What do we want? $15! When do we want it? Now!” throughout the downtown corridor. 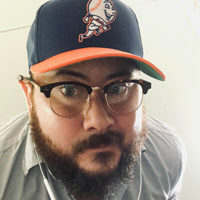 In a more just society where sporting and cultural events were made accessible, some of these minimum wage workers might have been able to go to the big game. With individual tickets averaging more than $5,000, however, it would take most of them hundreds of hours of their wages to buy just one. Create a $500K bond to be administered by the Minneapolis Department of Civil Rights to cover any unpaid wages for workers who work supporting the Super Bowl and whose employers commit wage theft and are unresponsive. 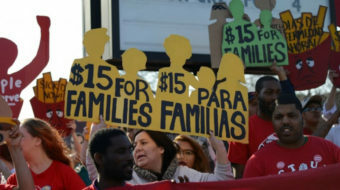 Publicly and privately support policy to create a long-term robust enforcement budget and mechanism in Minneapolis to ensure workers receive the wages and rights they fought for and won. 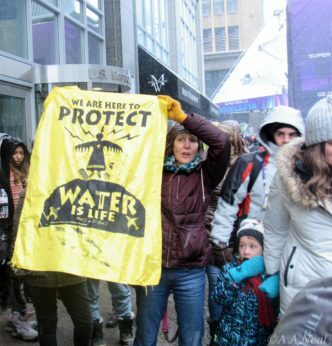 As Eagles and Patriots fans enjoyed the extravagance of Super Bowl Live—mobile ski ramps, live music, designated “fan zones” for shopping—several hundred local activists and Indigenous water protectors from Iowa, South Dakota, and Minnesota took over the sidewalk in front of U.S Bank headquarters, taking the crowd by surprise. In April 2017, U.S. Bank announced their environmental responsibility policy, which said the bank “does not provide project financing for the construction of oil or natural gas pipelines.” Since then, the bank joined credit facilities with Energy Transfer Partners—the company behind the Dakota Access Pipeline—totaling $5 billion. 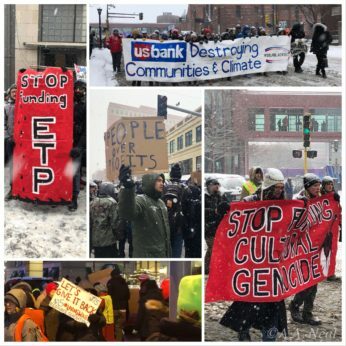 Energy Transfer Partners has been responsible for violating Indigenous sovereignty by destroying lands and enabling violence against water protector activists by hiring private security agents who provoked what was a non-violent demonstration in Standing Rock, N.D. 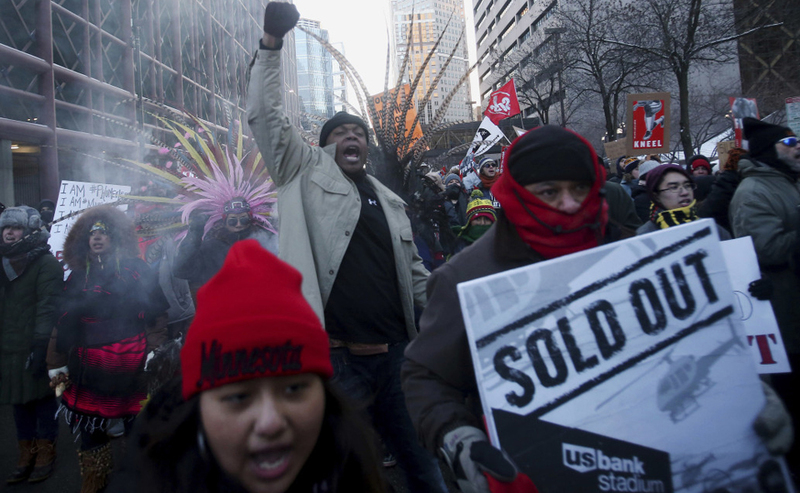 The afternoon demonstration came after the bank spent months driving a public relations campaign to win Super Bowl hosting rights for Minneapolis. The Minnesota Vikings play at U.S. Bank stadium. Just food for thought. Inside the St. Paul Labor Federation hall, several dozen union members, workers, and allies gathered to support the Franklin Street Bakery workers who have spent years fighting for union recognition and safer working conditions. These bakers, members of the Bakery, Confectionery, Tobacco Workers and Grain Millers Union (BCTGM) Local 22, have faced intimidation, retaliation, physical assault, and, more recently, deadly levels of carbon monoxide on the job. Baires had lost consciousness while at work and was transported to the emergency room where physicians informed her that she had suffered carbon monoxide poisoning. “The doctor told me it was a miracle I was alive… I had a deadly amount of carbon monoxide,” she said. Franklin Street Bakery has had three OSHA inspections in the last decade. Two of the inspections, in April 2011 and October 2006, found serious violations. The bakery is co-owned by Wayne Kostroski, a prominent business figure in the area who hosts the “Taste of the NFL” celebratory fundraiser that encourages wealthy donors to “party with a purpose.” This year the “purpose” was to “tackle hunger” by raising money for local food pantries—ignoring the fact that most of his bakery’s employees rely on the food shelves to survive courtesy of his poverty wage business practices. 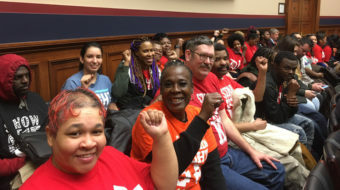 The workers’ two-year campaign has highlighted workplace abuses, including low wages, arbitrary treatment, and managers who bully, yell, and curse. Workers also allege that managers have inappropriately touched female employees. Marching and chanting from the labor hall to the “Taste of the NFL” event, workers let Kostroski know that their fight would continue until they win union recognition, a living wage, and a safe workplace. With the coldest Super Bowl ever about to take place—temperatures hovered around zero degrees, with wind chill it felt close to minus 20—several hundred activists gathered and took over the streets near Peavy Park. 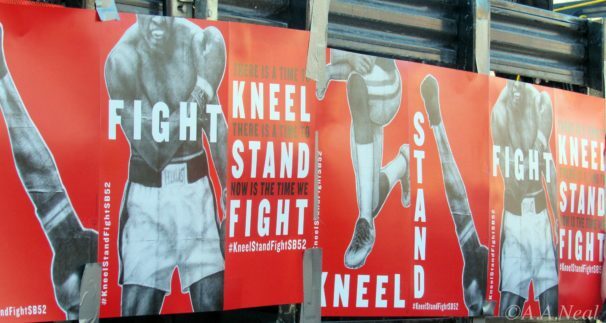 Inspired by the NFL players who took a knee to protest police brutality, racism, and white supremacy—Colin Kaepernick, Michael Bennett, Marshawn Lynch, and athletes from across the NFL and all the way down to local high schools—activists continued to highlight these injustices, determined to keep the conversation in the public eye. Around 40 activists took over the Metro transit green line train tracks near the University of Minnesota. Locking arms—some locking themselves to the station railing—demonstrators blocked the train for 90 minutes, delaying fans and calling attention to the fight against police brutality. Police forcibly removed activists, and 17 were arrested and cited for unlawful interference with transit, according to a Metro spokesperson. Just as Pink began to sing the national anthem, a group of activists managed to reach the stadium’s main gate and took a knee for all the Black lives stolen by police. “From Jamar Clark and Justine Damond to Philando Castile and Phil Quinn, justice has been denied for these and many other lives stolen by Minneapolis and St. Paul cops. Our communities will dish out millions to these same police departments to provide ‘security’ for the Super Bowl, while nothing has been done to address police violence,” said one activist. While no players took a knee Sunday night—a fact I’m sure Trump and his allies will brag about—it is safe to say that the 2017 regular season “take a knee protest” was a success. Just ask those who were a part of making history outside Super Bowl 52.